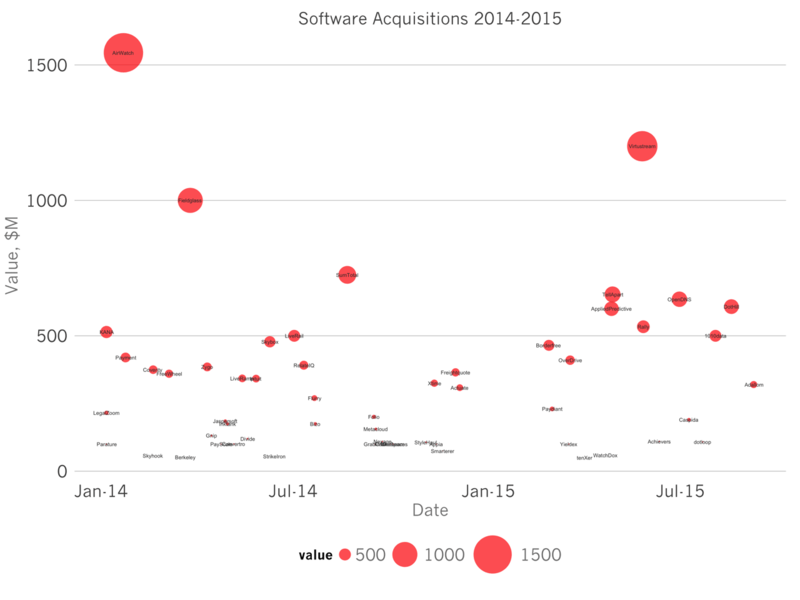 In the last 22 months, there have been 4 $1B+ software IPOs and 3 $1B+ software acquisitions. But compared to 2014, 2015 was a meager year for startups looking to go public or be acquired. The chart above plots the M&A activity over this period. The M&A market halved in activity. In 2014, $11B of disclosed M&A occurred. I’m excluding take-private transactions of public companies like SAP/Concur, Bain/BlueCoat, Oracle/Responsys, etc. Through November 1st 2015, transaction values dipped 40% to $6.8B. The number of transactions has also nearly half from 38 to 17. However, in 2015 the median acquisition was worth $410M, compared to $193M in 2014, indicating that buyers are not buying as frequently, but when they are, they spend more. In 2015, the IPO Market stalled. 13 software companies went public last year raising $1.6B, an average of $105M per company. So far in 2015, only Xactly has gone public raising $56M. Looking at the data in another way, at the beginning of 2014, the enterprise value of all publicly traded SaaS companies totaled $151B. As of Friday, that same basket of companies is worth $176B. And all the companies that have gone public in the last 23 months are worth $13.7B or about 7.7%. During the same period, forward revenue multiples, the primary metric used in public markets to value software companies, has fallen from 8.1x to 5.3x. Why was the exit activity in 2015 starkly different than 2014? It’s not that the quality software companies has declined, nor have growth rates of software startups dwindled. Rather, startups are finding the private financing markets far more attractive than the public ones. In the private markets, software companies can raise capital at 10 to 15x forward revenues, a premium of 200% over the public markets. The difference in public and private valuations is only exacerbated by huge increase in the growth capital markets, pushing private valuations up, and the downward pressure on multiples facing publicly traded software companies. These opposing force have increased the relative prices of software startups, undoubtedly contributing to the substantial decline in acquisition activity. What does this mean for 2016? I suspect a major trend is the private markets will slowly come back into line with the public markets, paying similar forward multiples for companies. This will catalyze a wave of acquisition because for the last 18 months or so, the opposing forces of increasing private valuations and decreasing public valuations have made start up acquisitions substantially more expensive. In the next 18 months, the converse will be true and cash-rich acquirers who have been looking to bolster their product lines and develop new areas for growth will perceive startups as far more attractive acquisitions at more reasonable prices. And the IPO market will reward those companies with exceptional growth and relatively modest burn rates. Growth rate is still the number one correlating factor to forward multiple for software companies, anti-correlation has increased over the last two quarters from 0.3 to 0.43, indicating public market investors are just as hungry for growth as ever with one caveat. A path to short term profitability will be much more important in 2016 than before. I do want to note that the public markets have been very receptive to SaaS companies. In the same period, the median SaaS IPO has increased 17% from its IPO price, and is on average above 35% from its last round post-money valuation. And with the number of superfast growing, capital efficient software companies in the private market, I expect 2016 to be healthy year for software IPOs and exits - much better than 2015.